After seven intense competition days, the 2019 AMBC Pan Am Games Qualifiers has finally come to an end in Managua, Nicaragua. Regrouping 32 nations across the Americas, the finals crowned 15 champions, including Tammara Thibeault from Canada. Indeed, the middleweight boxer from Montreal was the sole Canadian to reach the final of the tournament after two convincing victories in the quarterfinals and semifinals. For her final duel, Tammara squared off against Columbian boxer Jessica Caicedo, the 2018 World Championships silver medalist in the 81 kg division. Over the course of the three rounds, Tammara proved to be the more active boxer, connecting numerous powerful punches on her opponent, and was declared the champion of the 75 kg weight category with a 4-1 decision in her favour. 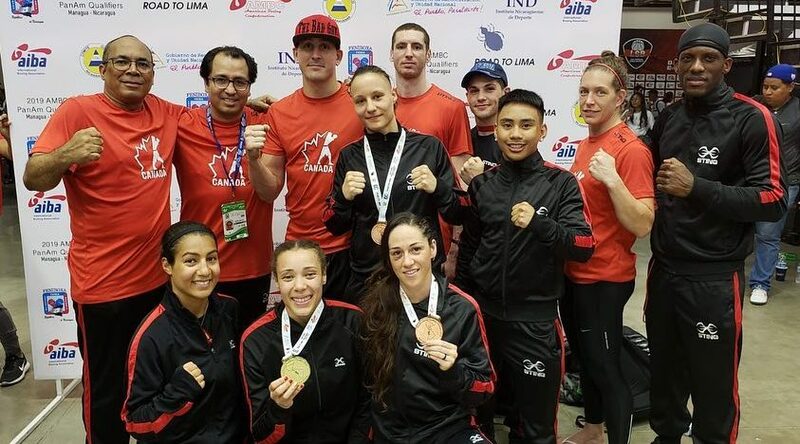 Joining her on the podium, Sabrina Aubin (57 kg) and Irene Fiolek (60 kg) both claimed the bronze medal in their respective category bringing Canada’s medal count to three for the 2019 AMBC Pan Am Games Qualifiers. In addition to the medals, Myriam Da Silva (69 kg), Harley-David O’Reilly (81 kg) and Bryan Colwell (91 kg) all finished in the Top 8 of the competition. The 2019 Pan American Games are set to take place in Lima, Peru from July 26 until August 11. An official team nomination will be announced shortly. For all the documents (draw sheets, results, schedule, statistics, etc.) relating to the 2019 AMBC Pan Am Games Qualifiers, consult our Event Webpage for all details.